Our School was founded in 1906 by Miss Beatrice Goode (Head 1906-1938) as a result of local demand from parents. Miss Beatrice Goode, along with her sisters Ada and Patricia, aimed to give girls an education equal to that of boys, although at that time boys were also admitted. The school began as a PNEU school, a system of schooling set up by Charlotte Mason (1842-1923). Originally situated at the site of the current Lloyds Bank on Church Road, the school moved to its current location in 1928 when it was seen that expansion was necessary. 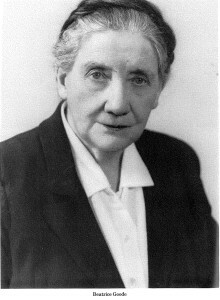 Miss Margaret Morris (Head 1955-1971) joined the School in 1934, having graduated from the House of Education, and taught Mathematics and English. Promotion came sooner than expected, when, during the war, two other senior members of staff left and she acted as Senior Mistress. 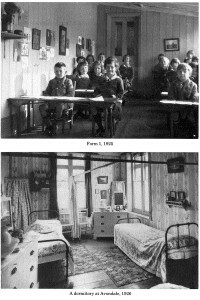 She stayed at the School throughout the war, taking charge while Miss Mary Gillies (Head 1938-55) was away at Langdale. The years after the war were spent trying to get the house back in order, restoring houses and building up the depleted register. It was at a time of promise and of challenge when Miss Morris took over as Head in 1955. The School has flourished for over a hundred years because it has provided an excellent education whilst adapting to the needs of its pupils and changing requirements from society. This is evident from the history of the School’s first eighty years written by Angela Davies. She showed how at first the school provided a general education, fitting women with a life bringing up children at home. Although something of a caricature, this does indicate the absence of academic pressure in those days. As women increasingly wanted qualifications to earn a living, the school needed to provide a more rigorous academic timetable and drop the non-competitive PNEU system. Mrs Doreen Harford (Head 1971-1979) began the transformation but funds were limited. It could proceed more quickly after the sudden largesse which came from the sale of the sister school at Overstone and the appointment of Overstone’s Deputy Headmistress as Mrs Harford’s successor. 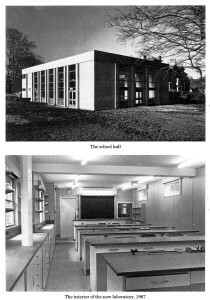 Mrs Barbara Webb (Head 1979-1992) aimed to transform the school into ‘A Mid-Sussex High School’. She recognised that, with the loss of the grammar schools in the state system, parents were now prepared to pay for an academic institution offering improved examination results. So the numbers at Burgess Hill School increased when other private schools were closing. Others failed to see that the private sector needed to fill perceived gaps in state provision. The introduction of League Tables was another challenge that Burgess Hill School has risen to. It is remarkable how consistently it has maintained its place as one of the highest ranking schools in Sussex, and earned a very good position in the National Tables, in a very competitive area for independent schools. Over the years, various building work took place as a gymnasium and school hall were built, boarding houses purchased as well as new teaching blocks. The school rapidly grew to stand in a school site of 14 acres. Mrs Rosemary Lewis (Head 1992-2001) took over Headship at a time when the school was continuing to grow with many changes taking place in education and the expectations about what a good school should provide increased considerably. Mrs Lewis therefore established a collegiate style of leadership and management with a Senior Management Team to help her plan for the School’s future and take responsibility for various aspects of the day-to-day organisation. Mrs Susan Gorham (Head 2001-2005) took over as Head in September 2001. She brought with her an unsurpassed enthusiasm for girls’ schools and a passionate belief in the importance of high standards of behaviour and dress in creating the right atmosphere for success. Her background and experience in education and health care were valued and she quickly established a reputation for wise counsel. She was succeeded by the Deputy Head, Mrs Ann Aughwane (Head 2006-2014) who was promoted to the role of Head, coinciding with the start of the Centenary Year. Keen to continue and build upon the work of Mrs Gorham, Mrs Aughwane immediately placed great emphasis on the importance not only of the high academic standards achieved by the girls, but also the provision of opportunity in every way possible. Following Mrs Aughwane’s retirement in 2014, Mrs Kathryn Bell (Head 2014-2017) was appointed as Head. During her leadership the school was rebranded, including a name change from Burgess Hill School for Girls to Burgess Hill Girls. After 20 years as a teacher at the school and 11 years as Deputy Head, Mrs Liz Laybourn (Head 2017 – present) was appointed as Head of Burgess Hill Girls. Under ​Mrs Laybourn, the school is poised to further its journey of contin​uing​ development,​ innovation and outstanding academic performance.